Dune Jewelry provided a personalized item for editorial purposes. Opinions are our own. Until I moved to the Midwest a few years ago, I’ve always lived in a beachside community. I think the furthest we lived from the beach was when we lived in Portland, OR, and that was only about an hour or 90 minutes from the shore. I’ve been battling a case of the beachy blues lately. Anyone who lives by the beach knows that, even in winter, the beach is a magical place to visit. When Dune Jewelry recently contacted me with the opportunity to check out one of their gorgeous sand jewelry items, I jumped at the chance. I mean, if I can’t visit the beach, I can at least have a little piece of the beach that I carry with me. I chose Main Beach from Laguna Beach. That’s my “home beach” if you will. I’ve spent more days there than I can count – in all seasons. As long as I can remember, that’s where we went. Dune Jewelry makes this gorgeous jewelry that is all sand based. And, as we all know, sand from different places looks, well, different. The rocks and other organisms and debris that breaks down to make sand is different at almost every beach. Dune Jewelry has an enormous collection of this sand – known as the Sand Bank – from over a thousand different beaches and places. When you order a piece, they take a bit of this sand, mix it with their magic blend of polymers, and make your custom piece of jewelry. Pretty awesome, right? Of course, you get to choose whatever sand you want from their extensive collection. They even had infield dirt from a few Major League ballparks. Um, hello fabulous gift for the fellas. What if they don’t have the beach I want? In the off chance that they don’t have sand from the beach of your choice, you can send in your own sand. There are detailed instructions on the site about how to collect and clean the sand, as well as the minimum quantities required. 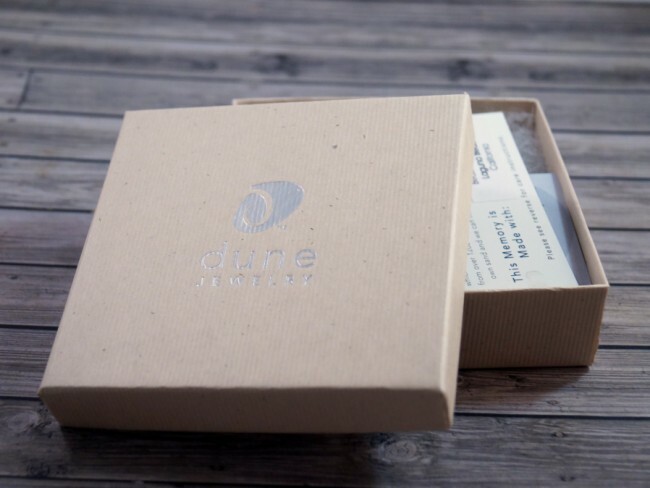 You can check out all of the gorgeous offerings from Dune Jewelry on their website. You can also connect with them on Facebook or Twitter. Awe, what a great idea!!! I would love one from the black sand beach we visited in Hawaii!! We have lots of black sand from Hawaii in our Sandbank and it makes gorgeous jewelry! That is awesome. It is definitely a unique gift that would mean something truly special. Plus it looks fabulous too. What a pretty necklace. I love the idea of carrying it with you! This is really cool! It would be an awesome personalized gift or a great reminder of a trip you took. That is stunning!! I know my sister would absolutely love this!!! very pretty, love the color with the accent of the silver! Beaches really do have terrific memories wrapped up in them. Love this idea! that’s a really neat idea! i’m going to send to my friend lisa- her family has a home on long beach island I think she’ll love to get a necklace for her mom and grama for mothers day! These would be a great keepsake to get the kids as a memento of a family trip. I am so happy about this! I am not going to go into detail, but this is exactly what I need for some peace of mind right now living in Chicago away from my beach. YAY! I don’t wear a lot of jewelry, but I love wearing pieces that are both unique and beautiful. This definitely fits the bill. 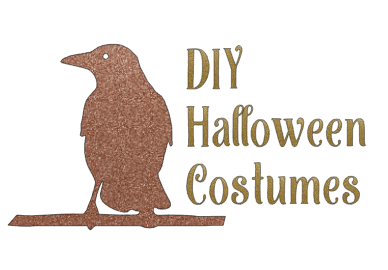 It’s lovely and something I would wear all year round. Those are so pretty! I’d love to be able to carry the beach with me. This is absolutely beautiful. Simple but, versatile. I love it. Wow! So Pretty! I would LOVE a piece of jewelry like this! So unique! This is such an awesome idea! I have sand from my honeymoon that would be cool to have done. You can send us the sand you collected from your honeymoon and we’ll turn it into a beautiful, wearable piece of jewelry! I have a ring that I mixed sand from where my husband proposed and where we honeymooned. It’s my favorite piece of jewelry! How beautiful, I love keeping a treasure like this! That’s so pretty! I love the neutral color! How neat! We’ve visited so many beaches lately! I wish I had some of the white sand from Pensacola! We definitely have Pensacola sand in stock. It’s very white and quartzy…makes very pretty jewelry. Absolutely beautiful! 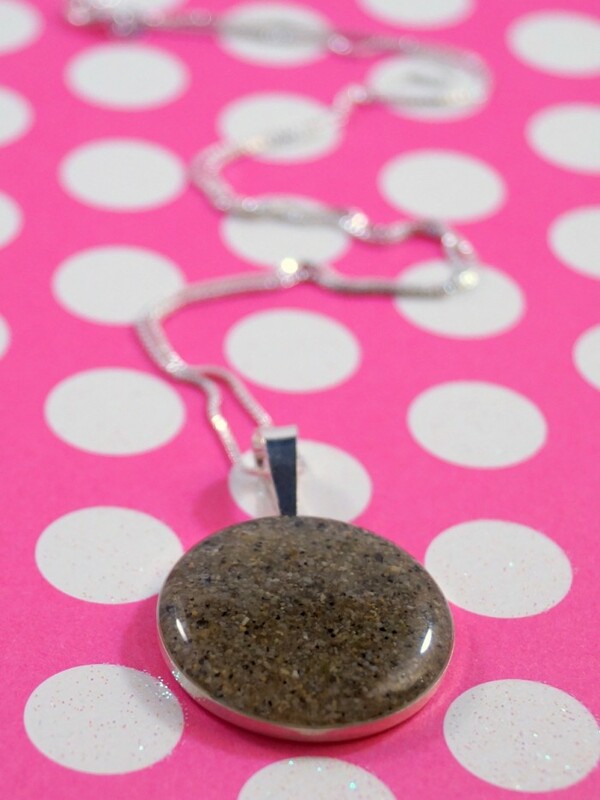 I love that you can send in your own sand to be put into this lovely necklace. What a great idea. Everyone has a favorite beach I’m sure. Mine is in Jersey, would love a little trinket with Jersey sand and I just had an idea, I’m getting one made up for my girlfriend who loves the Jersey shore and used to live there. Thanks for bringing attention to this wonderful store. What an amazing idea! I live on the coast, I would love to have some local sand. 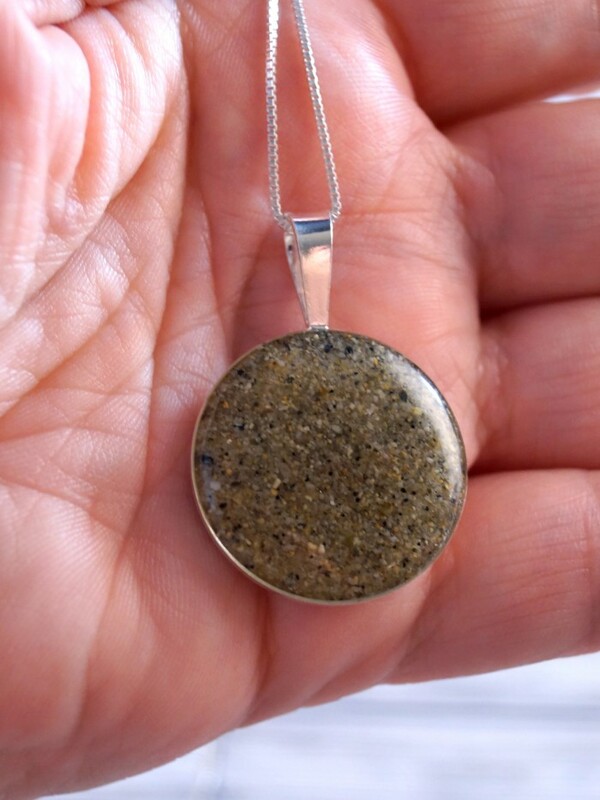 I think this is an awesome idea to make jewelry out of sand from some where special to the customer. It is very original! That necklace is so pretty. I just love the idea of sand jewelry anyway. 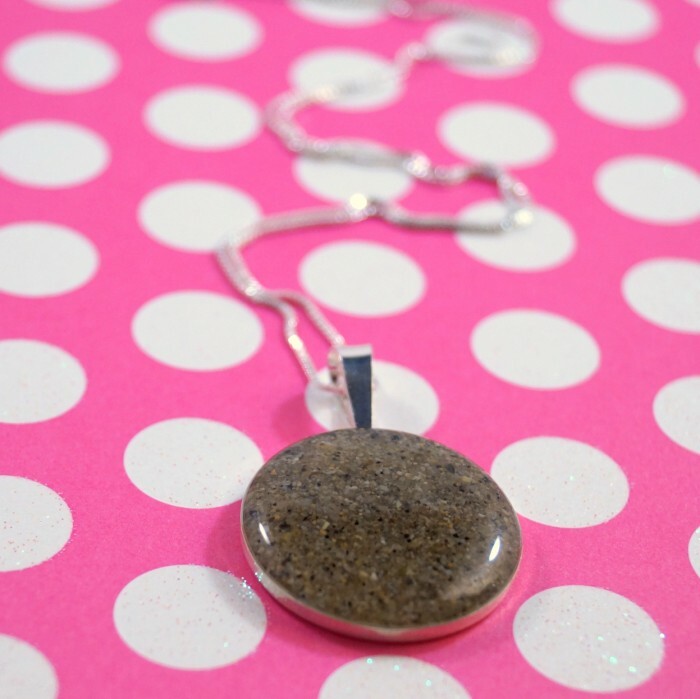 That is so cool that you can send in your own sand to get personalized jewelry. These are so pretty and unique. I’ve never lived by the beach but I sure wish I did! I absolutely love this idea! I would love something with sand from my favorite childhood beach, and this would make a really great gift as well. Wow ~ awesome pictures and beautiful pendant! I love the whole idea…just gotta find a little money in the budget and I’ll be carrying it with me too! I love this idea!! I want one for myself, my best friend, mother in law, stepmom AND sister. I think I will have to narrow that list down, lol. I would personally want sand from Seaside, the coastal town we always visited when I was little. This is very interesting, it’s the first that I’ve heard of this beach jewelry. This would make a great gift for someone who want a keepsake from a beach that has special meaning for them. Thank you for sharing this review.